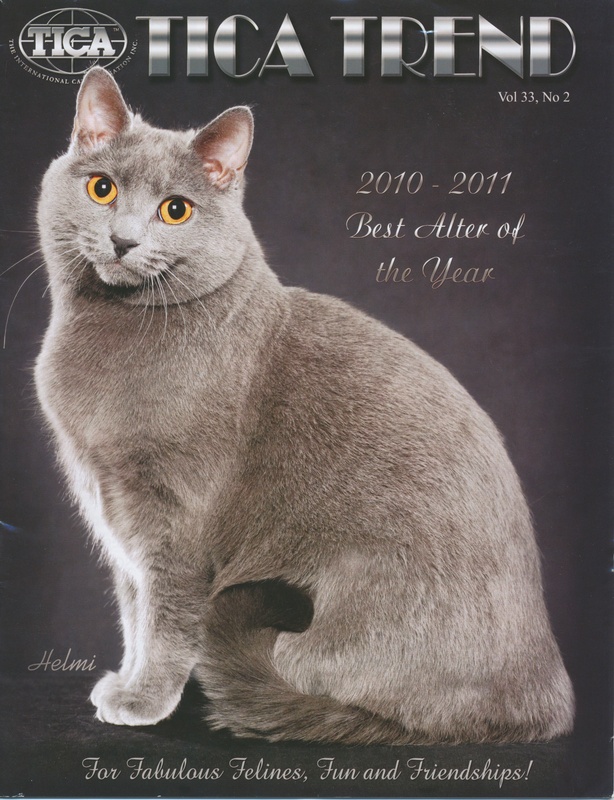 This is the story of young Chartreux Alter who started his adult show season to work towards his TICA titles and brought home TICA’s International All Breed Alter of The Year award for 2010/2011, achieving what no other Chartreux has accomplished in any class, in any association. IW SGCA Grandbois Etienne Guittard was bred by Nancy Dionne and co-bred by Carole McFadden. He is owned and adored by Carole McFadden, Chet Walborn and Nancy Dionne. An old French tradition calls for Chartreux to be named alphabetically by year and 2009 was an “E” year. We support Nancy’s dedication to using French names. Etienne was named in honor of a famous young French Chocolatier, Etienne Guittard, who immigrated to America during the California Gold Rush. He founded the Guittard Chocolate company of San Francisco. We say that Etienne is sweeter than chocolate! Etienne and his family live in Boise, Idaho. Idaho is a great place to live but it is totally void of any TICA shows. The closest TICA show is at least three hundred miles away and in a different region. Living in Idaho means you probably fly to most TICA shows unless you are fond of very long car trips. Etienne began flying to shows at 4 months of age which may explain why he is such a great traveler. Initially, our only goal for the show season was to pursue Etienne’s TICA titles. At the beginning of the show season we were unsure that we would be keeping Etienne or his littermate Grandbois Edith Piaf (Edit’). In fact we had discussed with Nancy that we would show the two kittens to Regional Wins in the kitten class and then they could go to their new homes. Chet and I already had three cats and we felt that was a good number. There was a couple who wanted two kittens who Nancy thought would be a great forever home for Etienne and Edit. Chet had cautioned me during their kitten showing “don’t get too attached to the kittens!” I assured Chet that we would show them until they were 8 months old and then they would be on their way to their new home. When their time in the kitten class came to an end both Etienne and Edit’ had done quite well. They both achieved very strong NW Regional wins which were achieved with them competing against each other at almost every show. Their time was up, but wait, wouldn’t it be best to make sure they earned their TICA titles before leaving for their new home? Well of course, it made perfect sense and Chet was in agreement: “They would earn their titles and then be ready to go to their forever home.” Edit had already earned her Quad title in her first few shows at the end of the 2010 show season. Since Auggie, our first Chartreux, was finishing up his IW and LA campaign, we waited for the start of the 2010/2011 show season to take Etienne out for his titles. We knew I was going to really miss showing Auggie so continuing on with Etienne for a while would help fill that void. By this time, Etienne and Edit both knew what Chet and I had not yet admitted, they were already in their forever homes! At Etienne’s first adult show he was High Scoring Alter. This was to become common place during the remainder of the show season. We had never anticipated that he would have such a strong start at such a young age as Chartreux mature slowly. By the time the Estimated Standings were first posted during the show year, Etienne was in the #1 position. We did not expect this to last, there were so many wonderful Alters being shown, many of them much more mature than Etienne. By this time Etienne already had more than enough points for a solid Regional Win. Chet agreed that we could continue to show Etienne until he was passed in the rankings, then he could retire with his TICA titles, two Regional Wins and possibly an IW. We were looking forward to showing him at the Annual in San Jose even though we expected him to be passed by the conclusion of the show. Actually Etienne had a pretty good show at the annual in spite of the fact that he was going up against the top winning Chartreux Alter of all time. He came out of the Annual in the same position he entered. We still didn’t expect Etienne to maintain his position, but it seemed crazy to stay home when you are on a winning streak. You would always wonder what could have happened if. . . . . and besides we were having a great time! Not only were we enjoying meeting wonderful new friends, seeing amazing cats, and traveling to new places, but we just didn’t want to stay home and not be able to enjoy the TICA camaraderie. Etienne has been a joy to show. He seems to really love traveling with us. He eagerly explores each new hotel room. Even with his his busy travel and show schedule he usually remains upbeat and happy. 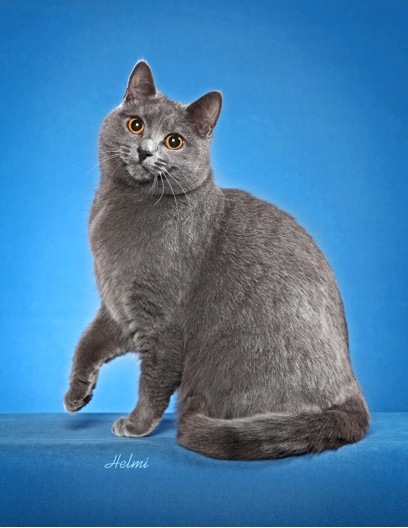 He enjoys just posing himself on the judging stand and displaying that famous Chartreux smile. Sometimes he will humor the judges and delight the audience by actually playing with the toys on the judging stand. One one occasion we encountered a rough situation which threatened Etienne’s sunny show demeanor. On a warm day at a show in Texas, Etienne was lounging on his grooming station when the temperature in the show hall rose enough to start the big roof mounted ventilation fans. One of the fans was directly overhead. When it engaged it made a strange noise and we both looked up to see the fan raise up out of its casing, displaying several inches of blue sky. Once the fan was running up to speed it slammed down with the loudest bang I have ever heard in a show hall. I had already taken hold of Etienne when I saw the fan lifting up. When it came crashing back into place I could not hold him, I had to lay over on top of him to contain him. I managed with some difficulty to get him back in his Sturdi cage but the damage was done. The fans were on the attack and he was ready to head for home with or without me! Etienne was instantly transformed into a blue version of ‘Chicken Little!’ “The sky was falling!” and he had experienced it first hand! There was no persuading him that everything would be all right. We moved our set up, three times, all to no avail. His ears were plastered to his head, his eyes were wide and fixed on the ceiling, his entire body was flattened as close to the bottom of the cage as he could manage. The next morning we returned to the show hall hoping that he would have forgotten about the previous days event. No such luck, he displayed the same behavior. He was so stressed I decided it was best to remove him from the show hall. We were sure this would expedite his decline in the standings however that was not our biggest concern. We were afraid that this might permanently affect his enjoyment of showing. It took time and several shows in quiet, familiar show halls for him to begin to recover his confidence. From that time on he intently surveyed every ceiling of every show hall for the dreaded fans. Unfortunately, some show halls that had not been an issue previously were now a problem if there was the slightest noise from a fan. I began calling show management and sometimes even the building maintenance staff at show halls new to us before deciding to enter shows. Even though he had a setback, Etienne remained a joy to show. He just kept on going and going, much like the Eveready Energizer Bunny. We kept showing and Etienne maintained his placement. As the show season progressed things changed. We actually got rather used to Etienne’s position in the standings. Our feelings changed from expecting to be passed to hoping it wouldn’t happen. Fortunately, since Etienne never dropped below his #1 placement, I didn’t have to honor my promise that I would stay home when he was passed. I am told that this is the first time that any Alter remained #1 during the entire show season, start to finish. Of coarse Etienne and Edit are still in their forever homes, just as they knew all along! Did I mention that in addition to being quiet, easy going and mellow that Chartreux are very cerebral? They often know things way before the rest of the family! When you first obtain a Chartreux you could be lulled into thinking they are a little ‘slow’. By the end of the first month you discover that you are having trouble keeping up with what is going on in the mind of your Chartreux! We are so fortunate to have had such a wonderful experience showing in TICA. This past year has been a once in a lifetime experience. We have enjoyed meeting so many wonderful exhibitors of which many we now consider dear friends. We have been introuced to the most gorgeous cats and we have traveled to many places we probably would never have visited otherwise. We are also lucky to have such great photographers to work with in the cat fancy. Special thanks to Channan, Helmi, L. Johnson and Tetsu who have helped preserve these special memories with beautiful images. Our sincerest thanks to all of the judges, fellow exhibitors and club members who made this great experience possible. The outstanding quality of the cats competing in the Alter Class made Etienne’s win a truly humbling honor. This year, Etienne is having a relaxing season finishing up his final leg for his Lifetime Achievement title. Best wishes for all of your hopes and dreams! Sound Credits: The Maid with the Flaxen Hair (La Fille aux Chevaux de Lin) by Claude Debussy performed by Tal-Haim Samnon. Use the video controls below to adjust volume or turn off sound.